I went to LA over labor day weekend and expected to hate it, having absorbed the LA-negative attitude of the Bay Area. To many people that call the Bay Area home, the idea of actually enjoying LA is as offensive as the existence of styrofoam. So that’s the shtick you get from many Bay Area lovers, and if you believed them, you’d come away thinking that not only is LA a very lame city, but that it’s a moral and spiritual blight on the West Coast that poses a constant hazard to innocent citizens everywhere. So I thought I would hate it and prepared myself accordingly. Then something strange happened, oh yeah, it turns out LA IS INCREDIBLE. No one told me about the mountains you can see through the smog on a smoggy day and just see normally on a good day. No one told me about the mysterious magical summer nights where you can actually go outside without wanting to eat your own socks to raise your internal body temperature. No one told me that you could purchase an Argentinian plate of pasta from a movie actress that was from Vanuatu and the 2nd cousin of Leonardo DiCaprio. Or that you could walk into what appeared to be a lame restaurant and get an incredible philipino meal for super cheap while listening to live piano music and using a bathroom that has a shower in it. And the strange tatooed people that wear hats and different kinds of shoes, where the men don’t just wear blue shirts and slacks and the women have weird piercings in their face. I don’t know – it was kind of lovely. It was especially nice how unappealing most things looked – I mean, strip malls as far as the eye could see, hole in the wall mexican restuarants with no marketing budget, streets as wide as highways wherever you go. 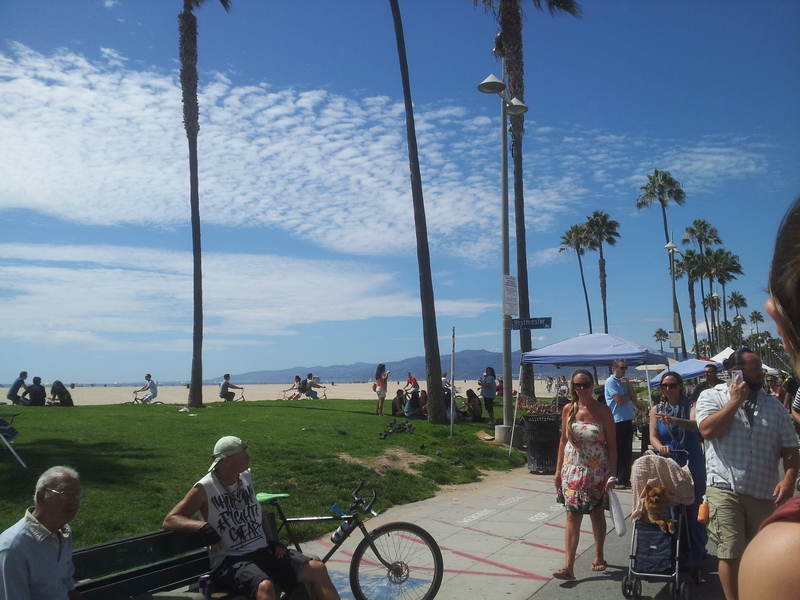 It would be hard to pinpoint something picturesque in LA – was it the bearded lady I saw? Or what about the stick-woman wearing needle-thin stilletos and a napkin? Or the veiny elderly man that hobbled in his walker to sit down while waiting to eat at Norm’s, a diner with some of the most average food I’ve ever tasted. People are willing to live there just because they’re following their dreams. That’s something nice, right? And that’s not everyone even – I don’t know how to say it. There’s more to LA than the smack talk, even though that’s there too. There’s just more there. That can be LA’s slogan: There’s more here. So give it a chance, Bay Area. Maybe you’ll like it. It’s a difference between the noir in ones life and the bright sunny side. If you enjoy the fog and mystery the Bay Area is for you. If you want to live with a tanned body and basking in the brightness. I live in New England, we get both. And blizzards. And hurricanes. Funny that “I love LA” -the guilt which dare not speak its name, always has to come with an essay! And a fine one from you at that!